2018 was an year which rained celebrity weddings and HOW! 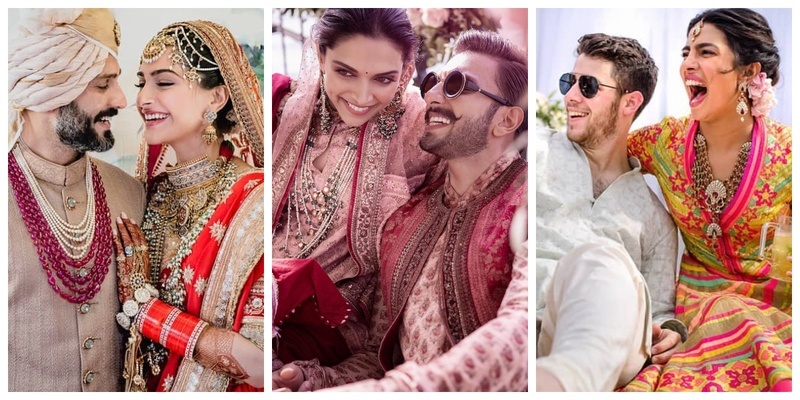 From spur-of-the-moment ceremonies (like Justin and Haley), beautiful destination ceremonies ( like #Deepveer’s Lake C0mo Wedding), grand royal weddings (like #Nickyanka) to one of the most extravagant, monumental events of the decade (cough cough, The Ambani Wedding), 2018 has definitely been an year of incredible and stunning celebrity weddings! Here is a complete list of all the celebs who got married this year and set some major #WeddingGoals along the way! Deepika Padukone and Ranveer Singh’s wedding was one of the most awaited weddings of the year, and I am still swooning of their pics where they look so in love! And even after they ended their nth reception, I’m literally not content with seeing all the pics and videos! Did the bride take the husband’s name? No. Sonam Kapoor and Anand Ahuja’s wedding was one of the most popular weddings of 2018, with the bride, her Bollywood khandaan and BFF’s sharing the tiniest bits! Here’s saying, we love a bride who doesn't hold back from sharing the love she felt on her D-day, and her love story is still #Relationship goals! Did the bride take the husband’s name? Yes and so did the groom! Sonam Kapoor is Sonam K Ahuja now as per her Instagram, while Anand goes by Anand S Ahuja! What did I say, they never stop giving couple goals! Priyanka Chopra and Nick Jonas made a lot of noise when they got married the Big Fat Indian and Christian wedding ceremony way, after sealing the deal in a secretive engagement! This wedding definitely came a shock as lot was based on the speculation, thank god the couple didn’t hold back from sharing the journey of becoming Mr. and Mrs. now. Did the bride take the husband’s name? Yes. What happens when a businesswoman and heiress to one of the wealthiest families in the world ties the knot with a billionaire scion in a multi-city, multi-function, multi-crore wedding ceremony? It was Wedding of the Decade! Did the bride take the husband’s name? Well, it’s not been disclosed yet. Game of Throne co-stars Kit Harington married Rose Leslie, who is a descendant of Charles II, at the 12th-century castle her family owns in Scotland and it was all fireworks there. P.S., watching the whole GOT cast reunite - the living and dead from the show was the icing on the cake! Did the bride take the husband’s name? It’s not been disclosed yet. Mohit Marwah tied the knot with celebrity stylist Antara Motiwala in February, with Marwah being the nephew of Anil Kapoor and the whole Kapoor clan was there to celebrate it. Did the bride take the husband’s name? Yes. She goes by Antara Motiwala Marwah now. Who can forget the first royal wedding of the year – when Prince Harry and Meghan tied the knot at St George's Chapel, Windsor, on 19 May? The whole world witnessed it! P.S., The British royalty and Hollywood royalty came together for the couple's big day and I couldn't still get enough of the pictures. Did the bride take the husband’s name? Well the rules are different here. When you marry a British Royal, you don’t change your last name, the couple itself gets a new title. So Meghan Markle and Prince Harry go by Duchess and Duke of Sussex post their wedding ceremony! Neha Dhupia got hitched to actor Angad Bedi in a secretive and intimate ceremony in New Delhi and this was quite a shock! Did the bride take the husband’s name? Yes. She goes by Hailey Rhode Bieber now. Fashion influencer Chiara Ferragni tied the knot to singer Federico Leonardo at a secluded 19th-century palazzo in Sicily, Italy. The non-religious al fresco ceremony, dubbed as an Italian royal nuptial! As expected it was totally - Insta-worthy and as over-the-top as expected from the social media star! P.S., there was a pink-carpeted private plane for guests to a MET Gala-worthy room for photo ops to personalised M&Ms! Well well, these weddings will keep me awe-strucked and star-strucked for times to come!